7.55Mileage for Burgessville is incorrectly given as 31.87 from 1934-04-29 through 1935-06-23 CNR.CR.SOD.LSD.51/57 . 1876-01-01 Pt.D. & L.H.Ry. opens from Port Dover to Stratford Stevens-1960, p. 464 . 1876c Pt.D. & L.H.Ry. builds 18'×34'×14' frame, shingle roof, timber foundation station at Burgessville GTR.MD.1907, p. 215 . 1876c Pt.D. & L.H.Ry. builds 7'×12'×12' frame, shingle roof, timber foundation "closet" at Burgessville GTR-1907, p. 215 . 1878c Pt.D. & L.H.Ry. builds 12'×16'×8' frame, shingle roof, timber foundation "hand car house" at Burgessville GTR-1907, p. 215 . 1878c Pt.D. & L.H.Ry. builds 12'×136' single pen, double chute "stock pen" at Burgessville GTR-1907, p. 215 . 1881-03-04 G.B. & W.Ry., P.D. & L.H.Ry. and S. & H.Ry. merge to become the G.T.G.B. & L.E.Ry., a wholly-owned subsidiary of the G.T.Ry. Stevens-1960, p. 467 . 1886c G.T.Ry. builds 3" plank, timber foundation, 968 ft2 platform and 420 ft2 freight platform at Burgessville GTR-1907, p. 215 . 1912-04-01 Southbound G.T.Ry. freight derails at Burgessivlle The Globe (Toronto), Thursday, April 2, 1912, p. 15; The Simcoe Reformer, Thursday, April 4, 1912, p. 7 . 1917-11-08 G.T.Ry. standard plan no. 3 combination for new passenger and freight station at Burgessville approved B.R.C. 26720 . 1917c G.T.Ry. constructs 18'×75'×12' frame combination station with domestic brick platform NAC RG30 Vol. 10120 File 6340.29 . 1928-12-15 Burgessville Fruit Grower's Co-operative opens apple packing plant at Burgessville Daily Sentinel Review, 1928-12-15, pg. 1, cols. 1 & 3; The Globe (Toronto), 1928-12-17, pg. 33, col. 7 . 1920-06-27/1937-09-26 Burgessille operates as day train order office GTRS.OL.LSD.02/11, CNR.CR.SWOD.LSD.2/16, CNR.CR.SOD.LSD.21/64 . Railway facilities consist of a frame station and freight shed 18'×75'×12' with domestic brick platform built about 1917, a 3 car capacity cattle pen and chute, a team track 394 feet long and a service track 698 feet long, which also serves directly the United Farmers Co-operative and the Burgessville Fruit Growers. The village has a population of about 300 persons while the population contiguous to the line is about 750 persons. The land tributary to the line is all rich and highly cultivated farm and dairying land. At Burgessville - The United Farmers Co-operative who have concrete grain elevators adjacent to the railway right-of-way. The Burgessville Fruit Growers who have a concrete packing house adjacent to the railway right-of-way and Huges and Demontmerency dealers in feed, coal, wood, lumber, etc. and served directly by our team track. 1936-07-13 C.N.Rys. authorized to remove agent at Burgessville; caretaker to be appointed B.R.C. 53296 . 1938-04-24 C.N.Rys. closes train order office at Burgessville CNR.CR.SOD.LSD.65 . 1941-09-28 C.N.Rys. service to and from Burgessville as required to handle carload traffic CNR.CR.SOD.LSD.73 . 1964-10-25 Burgessville absent from C.N.Rys. time table CNR.GLR.LA.32, p. 22 . N&DA Postcard view (rotated and cropped) of south elevation of first station at Burgessivlle in GTR era; building in foreground is the "closet". N&DA Aftermath of the April 1, 1912 wreck. N&DA Clean-up of the April 1, 1912 wreck. N&DA South and west elevations of section station in the early CNR era. NAPL A9208-022 Aerial photograph of Burgessville. Marion Austin photo/JPS collection It has been more than a dozen years since Burgessville has seen regular train service and within a decade the rails will be lifted south to Norwich. 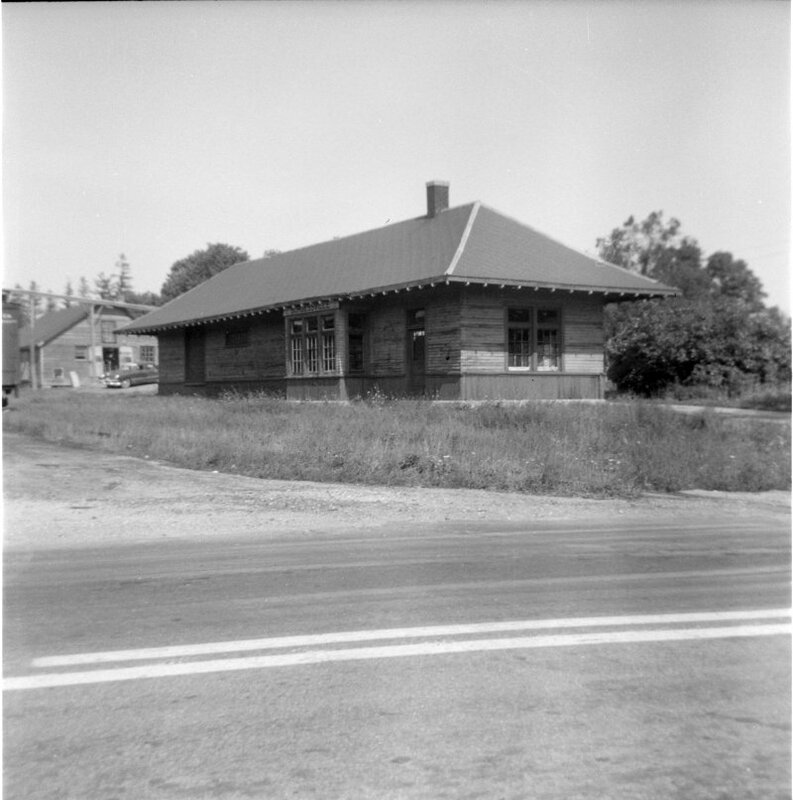 The station, once a train order office on the busy Port Dover/Tavistock Junction line, will serve its final days as a storage facility for the packing house across the tracks. Al Paterson collection Burgessville's rail service is a distant memory and the former CNR station now functions as a storage facility for the nearby packing house. Bushel lids are stacked outside the former waiting room windows. 1954c J.P. Smith C.N.Rys. Second depot.